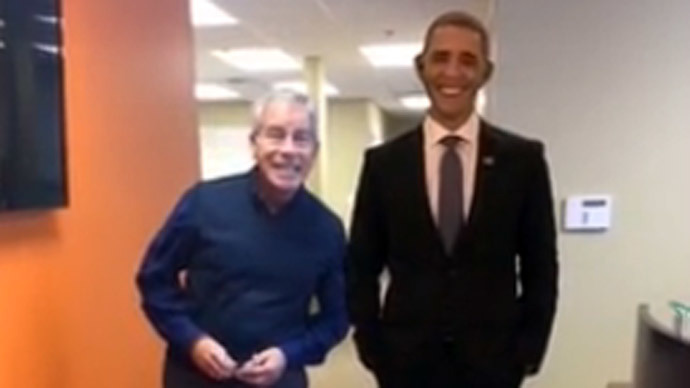 Want a video where you’re chatting with Obama? Or a selfie with a Bengal tiger? A new app, which creates the illusion of life-size holograms via a mobile device you can share on social media, has been launched on the Kickstarter crowd funding website. Michigan-based developer Robert Schinker has launched a Kickstarter campaign to get his new Virtuacast app to the market. The app creates the illusion of life sized holograms of celebrities, political figures, animals or animated characters chosen from the app’s library, on a mobile device’s screen. The hologram will appear wherever the special Virtualcast mat marker is in view of the device’s camera. In the promotion video for the app, the developers have a chat with US President Barack Obama and pet a Bengal tiger in augmented reality. “You may have heard about the excitement several years ago when much to the shock and amazement of audience members at the Coachela Music Festival, a hologram of TuPac appeared and performed on stage with Snoop Dogg. Or Michael Jackson's holographic performance at last year's Billboard Music Awards. The Virtuacast system makes it possible to create a similar illusion via your mobile device anywhere you choose,” the developers said. The user can record a video or take photos and directly through the app share the results on social media. The app is supported both by iOS and Android devices. According to a Facebook poll posted by the developers in July 2014 regarding which hologram people would choose to appear in their living room, most respondents preferred a celebrity figure. Schinker is aiming to raise $10,000 by May 21 to launch the app in July. However, the clock is ticking with only six days left. So far the campaign has only gathered one tenth of the amount needed. The idea is similar to the HoloLens augmented reality system that projects holographic images using sensors and a headset. It was presented by Microsoft in April.